This wondrous blend of Sweet Orange and Sandalwood hydrates and replenishes your hair, leaving your spirit uplifted. 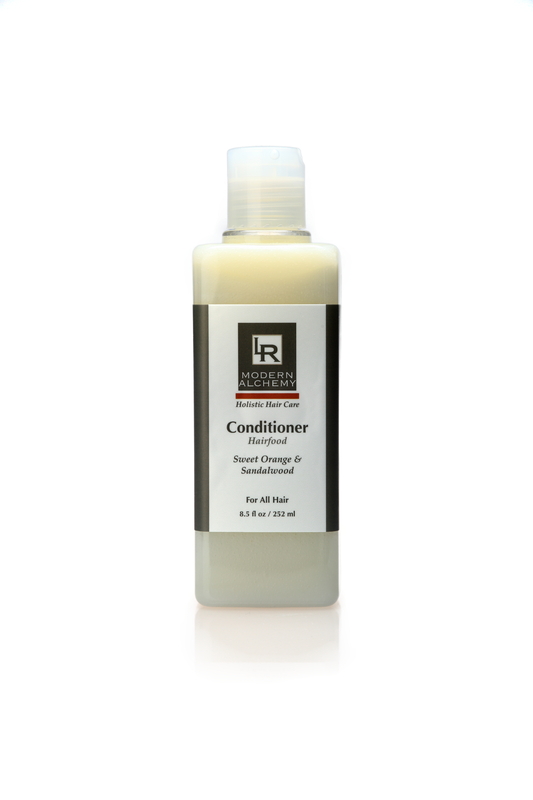 For all hair types, this conditioner will repair and condition your hair naturally, leaving it glossy and healthy, with a delicate scent. In this blend, Sandalwood is the natural aphrodisiac, synergistically blended with Sweet Orange for a truly magical experience. Apply to clean wet hair, and work through the ends… Rinse. For lustrous locks and a hydrating treatment leave on hair for 30 minutes. Tocophersols (Vitamin E), Simmondsia chinensis (Jojoba Oil), Purified water, Calendula officinalis, Citric acid, Cetyl Stearyl Alcohol (derived from vegetable oil), Cetrimonium cloride, Hydroxmethyl glycinate (a natural preservative derived from plant material). Blended with pure essential oils of Citrus sinensis (Sweet orange) and Sanalum spicatum (Sandalwood). Jojoba Oil — Wonderful for the hair and skin because it has absorption properties that are similar to our skin's own sebum. Jojoba oil doesn't evaporate like water-based moisturizers can. It balances oil production. Sandalwood Essential Oil — Widely known for its aroma and amazing medicinal properties. Sandalwood is suitable for all skin types and is especially useful for chapped,dry,sensitive or inflamed skin.Sandalwood Oil is very calming and harmonizing and has always been used for meditation and rituals. Sweet Orange Essential Oil — Refreshing and revitalizing, Sweet Orange oil, originally from China, is known for its multiple medicinal effects. Blended here with Sandalwood, it provides Vitamin C, and a beguiling, provocative but delicate scent that will leave you feeling fresh and uplifted.